In advance of the P3 2018 conference, the Canadian Council for Public-Private Partnerships launched a photo contest for members of Young Leaders in Infrastructure (YLI). We challenged them to submit unique, beautiful, fun and impactful photos shot of their favourite P3 project anywhere in Canada. And we were not disappointed! YLI Ottawa, in conjunction with PwC Canada, organized a breakfast seminar with the Canada Infrastructure Bank. The event featured a panel discussion on “The Next Frontier of Canadian Infrastructure: The impetus for and impact of the Canada Infrastructure Bank” facilitated by YLI Ottawa’s own Tyler Nash. YLI Ottawa hosted a networking event at Beerocracy. YLI hosted its marquee Social event of the year at Brassaii in King West (Toronto). This new location proved to be a great space, with sufficient capacity to host 300+ attendees. This annual event has been a great success and has provided an opportunity for delegates of the CCPPP Conference and YLI members to network in a casual setting. Thank you to our sponsors for making this event a continued success. YLI Calgary hosted a site tour of the new Rocky Ridge Recreational Facility followed by drinks and food at Brooklyn Pizzeria & Taps. YLI Montreal held their end of summer social at Marché des Éclusiers. YLI Vancouver held their summer social in the Sky Garden at the Telus Garden. YLI Calgary held an insightful talk with His Worship Mayor Naheed Nenshi on the City of Calgary’s growth and vision for infrastructure development. The YLI Toronto summer 2017 social event was once again a great success. Over 150 attendees joined for the food and drinks supplied by El Caballito. The Calgary Chapter of YLI held a brewery tour at Trolley 5. YLI and the Schulich School of Business’ Brookfield Centre in Real Estate and Infrastructure hosted a panel discussion and networking breakfast to provide more information on its graduate infrastructure programs. A YLI Montreal Committee Member, Jonathan Duguay-Arbesfeld, was guest speaker at l'École de technologie supérieure, lecturing about the public-private partnership model and introducing Young Leaders in Infrastructure to the group. YLI hosted its marquee Social event of the year at Pravda Vodka bar. This was an opportunity for delegates of the CCPPP Conference and YLI members to network in a casual setting. The venue was at full capacity, a sign of a successful event, but also a tip that YLI may have outgrown the place! Thank you to our sponsors for making this event a success. For the third year running, YLI has been contributing to hosting a select group of students at the CCPPP Annual Conference. YLI Executive Committee Members Steve Hobbs and Simon Lauzon led the presentation, which introduced the audience to the principles of public-private-partnerships and various financing options available under this procurement method. YLI Vancouver, in conjunction with McCarthy Tétrault, hosted an interesting breakfast seminar on the North American airport model led by moderator Jody Aldcorn. Steve Michoulas did an excellent job explaining the Canadian airport tier 1 model and how the Vancouver International Airport has successfully re-invented itself over the past few decades into one of the world’s most successful airports. Marie-Liesse provided her insight on Vantage Airport Group’s successful pursuit of the La Guardia Airport PPP project in New York. She explained the project’s unique challenges which included a constrained site, a new procurement model and the need to keep the airport fully operational during construction. The event included drinks, appetizers, video golf and racing simulators and was well attended by YLI Ottawa members. With the help of Affinity Partnerships, Young Leaders in Infrastructure organized a site tour of the BC Women's Redevelopment Project in Vancouver. 15 participants enthusiastically were toured around the site which is less than a year away from target service commencement. The YLI Toronto summer 2016 social event was a great success. Over 150 attendees joined for the food and drinks supplied by El Caballito and the stimulating networking provided by their fellow industry colleagues. Not even a few bursts of thundershower could dampen the mood, as the infra crowd briefly retreated to cover inside the restaurant and returned to the patio once clear. Business cards and shop talk were exchanged from 5:30pm all the way through until 11:30pm and attendees expressed much interest for similar networking events in the future. Be it local light rail transit, inter-city heavy rail or commuter trains, the future of rail in Canada and abroad is forecasted to grow in the next few years. The hospital is now fully operational and the tour allowed members to see it in its operating state. A lively discussion on P3s and city building with keynote speaker Toronto Mayor John Tory. YLI Committee Members hosted the Young Construction Leaders association and its members to a P3 101 session in TD Securities' downtown office. The discussion focused on a summary of public-private-partnerships, an overview of the use of the procurement model in Canada and a review of elements of the transaction structure as it pertains to construction, including risk transfer and NPV optimization during the bid process. Alfonso Sanchez | Project Finance Manager, ACS Infrastructure Canada Inc.
Simon Lauzon | Director, Debt Capital Markets, Project Finance & Infrastructure, TD Securities Inc. The YLI Calgary Launch event was a success. YLI members and other industry participants networked over 2.5 hour reception and they expressed interest in future similar events. The event was generously sponsored by Borden Ladner Gervais LLP and Brookfield Financial. The 2.5 hour seminar covered the assessment and interrogation of financial models, run by Jonathan Swan, Operis's senior trainer in financial modelling. This mentoring session features David Caplan, Vic-Chair of Global Public Affairs and previously Minister of Public Infrastructure Renewal for the Ontario government. The event was hosted by McCarthy Tetrault LLP and Global Public Affairs with a breakfast followed by an interactive discussion. YLI manned a booth during the conference to help attendees with questions, connect with P3 leaders and provide information on YLI. YLI’ers Simon Lauzon and Agnes von dem Hagen spoke to students selected to participate in the CCPPP Annual Conference Student Program. YLI is hosting the 5th Annual YLI Reception on the first night of the CCPPP conference. An opportunity to get away from your desk and meet people! This is a great way for tomorrow's leaders to connect with other groups and associations and develop a better understanding of how infrastructure investments are made. The event is generously sponsored by Fengate Capital Management and PCL Construction and will feature drinks and appetizers with members of the YLI Committee and other industry professionals. On October 1st, 2015, YLI Montreal invited young professionals to a networking reception hosted by COSIME Inc. and Dentons Canada LLP. The event was held at Dentons’ Montreal offices and featured Alexandre Riendeau as guest speaker. Mr. Riendeau is the CEO of the private consortium Signature on the St. Lawrence, responsible for the design, construction, financing, operations and maintenance of the new bridge over the St. Lawrence that and that will replace the Champlain Bridge. The event had a good member turn-out and Mr. Riendeau discussed his career path, his current CEO position and his latest projects. This mentoring session featured David Caplan, Vic-Chair of Global Public Affairs and previously Minister of Public Infrastructure Renewal for the Ontario government. The event was hosted by Dickinson Wright LLP and Global Public Affairs with a breakfast followed by an interactive discussion. YLI Toronto took a tour of Bridgepoint Health, a new 680,000-square-foot hospital that opened in April 2013. The historic Don Jail was incorporated into the new site and was refurbished into the administrative and education centre for the hospital. The facility is designed specifically for patients with complex multiple diseases. YLI Vancouver's Lunch and Learn with Partnerships BC was a great success. Amanda Farrell and team provided YLI with a highly formative presentation. The harbour views from Vancouver Convention Centre West proved to be the perfect venue for this fully subscribed event, with a crowd made up of British Columbia’s thriving and robust PPP industry. This mentoring session featured Marni Dicker, Executive Vice President, General Counsel and Corporate Secretary, Infrastructure Ontario. Over a breakfast hosted by Blake, Cassels & Graydon LLP, Ms. Dicker discussed her career path, advice and experiences, followed by an interactive Q&A period. As with our previous mentoring sessions, this was a unique opportunity to interact with one of our industry's leaders in an intimate setting. The seminar covered the assessment and interrogation of financial models, run by Jonathan Swan, Operis's senior trainer in financial modelling. Patrick Leitch – Capstone Infrastructure Corp.
YLI’ers Simon Lauzon and Agnes von dem Hagen were speaking to students selected to participate in the CCPPP Annual Conference Student Program. YLI’s activities were topped off with the now legendary YLI Reception on the first night of the CCPPP conference. The YLI Ottawa kick-off event was a success. At this well-attending inaugural event, YLI members and other industry participants networked over appetizers and refreshments at Backdrop Food and Drink. Attendees expressed much interest for future events. The lunch and learn session was hosted by Casgrain & Company Limited in Montréal. It included an overview of project and infrastructure financing. The P3 101 session offered by McCarthy Tétrault provided a high level tour of the public-private partnership Request for Proposals process and the project agreement documentation from the perspective of the project owners' counsel. Participants took a site tour of the new Pedestrian Tunnel which is being constructed to give passengers a reliable and easy access route to the Billy Bishop Toronto City Airport. YLI members from Toronto enjoyed a spring social and ping pong at SPiN! YLI Vancouver hosted their Spring Social at Rogue Kitchen & Wetbar. Participants heard from Damian Joy, Interim Executive Director, Infrastructure Ontario, Right Honourable Herb Gray Parkway and former President & CEO, Bilfinger Berger Project Investments Inc. Participants hear from Jim Dougan, President of Eastern Canadian Buildings for PCL Constructors Canada Inc. Mr. Dougan discussed his career path, experiences and lessons learned to date, with advice to others looking to advance in similar organizations. Paul Franciosa, Vice President, Fengate Capital Management Ltd.
Jamieson Knowlton, Vice President, Brookfield Financial Corp.
Matt Rinfret, Project Manager, Construction, PCL Constructors Inc. Participants took a tour of the award-winning Canary District Pan-Am Athletes Village project. Participants toured multiple areas of the site, including the new YMCA, George Brown College student residence and Canary District Condominiums. Participants took a tour of the the University of Montreal Hospital Research Centre (CRCHUM). Hosted by the CRCHUM team, this was a unique occasion to tour the first healthcare PPP project to have reached substantial completion in Québec. 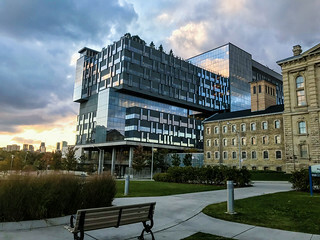 The new 68 000 m2 CRCHUM facility is a research and teaching facility located in downtown Montreal and is positioned as elite and avant-garde on the international arena – and the most important centre of health research expertise in Quebec. Avant la conférence P3 2018, le Conseil canadien pour les partenariats public-privé avait lancé un concours de photos destiné aux membres de Young Leaders in Infrastructure (YLI). Nous les avons mis au défi de soumettre des photos uniques, magnifiques, amusantes et percutantes de leur projet P3 préféré, partout au Canada. YLI Ottawa, de concert avec PwC Canada, a organisé un petit-déjeuner avec la Banque de l'infrastructure du Canada. L'événement comprenait une table ronde sur «La prochaine frontière de l'infrastructure canadienne: l'impulsion et l'impact de la Banque de l'infrastructure du Canada», animée par Tyler Nash, de YLI Ottawa. YLI Ottawa a organisé un événement de réseautage à Beerocracy. YLI a été l'hôte de son événement social de marque de l'année à Brassaii à King West (Toronto). Ce nouvel emplacement s'est avéré être un grand espace, avec une capacité suffisante pour accueillir plus de 300 participants. Cet événement annuel a été un grand succès et a donné l'occasion aux délégués de la Conférence du CCPPP et aux membres de YLI de réseauter dans un cadre décontracté. Merci à nos commanditaires de faire de cet événement un succès à nouveau. YLI Calgary a organisé une visite du nouveau centre de loisirs de Rocky Ridge, suivie de boissons et de nourriture à Brooklyn Pizzeria & Taps. YLI Vancouver a tenu son social d'été au Sky Garden au Telus Garden. YLI Calgary a eu une discussion perspicace avec le maire Naheed Nenshi sur la croissance et la vision de l'infrastructure de la ville de Calgary. L'événement social YLI Toronto de l'été a de nouveau été un grand succès. Plus de 150 participants se sont joints pour la nourriture et les boissons fournies par El Caballito. YLI Calgary held a brewery tour at Trolley 5. YLI et le Brookfield Centre de l'immobilier et de l'infrastructure de la Schulich School of Business ont organisé une table ronde et un petit-déjeuner de réseautage afin de fournir plus de renseignements sur ses programmes d'infrastructure des cycles supérieurs. Jonathan Duguay-Arbesfeld, membre du comité YLI de Montréal, a été conférencier invité à l'École de technologie supérieure, a donné des conférences sur le modèle de partenariats public-privé et a présenté au groupe les jeunes leaders en infrastructures. YLI a accueilli son évènement de renommée sociale de l'année au bar Pravda Vodka. C'était une occasion pour les délégués de la Conférence du CCPPP et les membres de YLI de se mettre en réseau dans un cadre décontracté. Le lieu était à pleine capacité, un signe d'un événement réussi, mais aussi une astuce que YLI peut avoir dépassé la place! Merci à nos commanditaires pour avoir fait de cet événement un succès. Pour la troisième année, YLI a accueilli un groupe restreint d'étudiants à la Conférence du CCPPP. Steve Hobbs et Simon Lauzon, membres du Comité exécutif de YLI, ont dirigé la présentation, qui a présenté à l'auditoire les principes des partenariats public-privé et diverses options de financement disponibles pour cette méthode d'approvisionnement. YLI Vancouver, en collaboration avec McCarthy Tétrault, a organisé un intéressant petit déjeuner-séminaire sur le modèle nord-américain de l'aéroport dirigé par la modératrice Jody Aldcorn. Steve Michoulas a fait un excellent travail en expliquant le modèle de l'aéroport canadien de niveau 1 et comment l'Aéroport international de Vancouver s'est réinventé avec succès au cours des dernières décennies dans l'un des aéroports les plus prospères au monde. Marie-Liesse a fourni son point de vue sur la poursuite réussie du projet Vantage Airport Group du projet PPP de l'aéroport de La Guardia à New York. Elle a expliqué les défis uniques du projet, notamment un site contraint, un nouveau modèle d'approvisionnement et la nécessité de maintenir l'aéroport pleinement opérationnel pendant la construction. L'événement comprenait des boissons, des hors-d'œuvre, du vidéo-golf et des simulateurs de course et a été bien accueilli par les membres d'YLI Ottawa. Avec l'aide de partenariats d'affinité, YLI a organisé une visite du site du projet de réaménagement de l'Hôpital des femmes Colombie-Britannique à Vancouver. 15 participants ont visité le site, qui est inférieure à un an de l'ouverture. L'événement social YLI Toronto l'été 2016 a été un grand succès. Plus de 150 participants se sont joints pour la nourriture et les boissons fournies par El Caballito et la mise en réseau de stimulation fournies par leurs collègues. Pas même la pluie pourrait freiner l'humeur, comme la foule d'infrastructure brièvement reculé pour couvrir l'intérieur du restaurant et est retourné à la terrasse. Les cartes d'affaires et de parler de l'industrie ont été échangées à partir de 17h30 tout le chemin à travers jusqu'à 23h30 et les participants ont exprimé un grand intérêt pour les événements de réseautage similaires à l'avenir. Que ce soit transport léger sur rail , inter- ville ferroviaire lourd ou trains de banlieue locaux , l'avenir du rail au Canada et à l'étranger devrait croître au cours des prochaines années. L'hôpital est maintenant pleinement opérationnel et la tournée permet aux membres de voir dans son état de fonctionnement. Une discussion animée sur les P3 et l’édification des villes avec le conférencier d’honneur John Tory, maire de Toronto. Comité YLI Membres a accueilli la Leaders association Jeune Construction et ses membres à une séance P3 101 dans le bureau du centre-ville de Valeurs Mobilières TD. La discussion a porté sur un résumé des-privé des partenariats public, un aperçu de l'utilisation du modèle d'approvisionnement au Canada et un examen des éléments de la structure de la transaction en ce qui concerne la construction, y compris le transfert des risques et l'optimisation NPV au cours du processus de soumission. L’événement de lancement de YLI Calgary a été un franc succès. Les membres de YLI et d’autres participants de l'industrie ont eu l'occasion d'établir des contacts lors d’une réception de plus de 2 heures et demie et ont exprimé leur intérêt envers la tenue d’événements similaires à l’avenir. L’événement a été généreusement parrainé par Borden Ladner Gervais LLP et Brookfield Financial. Le séminaire de 2 heures et demie a traité de l'évaluation et de l’étude des modèles financiers. Il a été animé par Jonathan Swan, formateur principal chez Operis dans le domaine des modèles financiers. Cette séance de mentorat a été animée par David Caplan, vice-président de Global Public Affairs et ex-ministre du Renouvellement de l’infrastructure publique du gouvernement de l’Ontario. L’événement – un déjeuner suivi d’une discussion interactive – a été organisé par McCarthy Tetrault LLP et Global Public Affairs. YLI tiendra un kiosque pendant la conférence pour répondre aux questions des participants, faire connaissance avec des leaders du PPP et fournir de l’information sur YLI. Simon Lauzon et Agnes von dem Hagen, membres de YLI, s’adresseront aux étudiants choisis pour participer au programme d’étudiants de la conférence annuelle du CCPPP. YLI anime sa 5e réception annuelle dès le premier soir de la conférence du CCPPP. Voici une occasion de sortir du bureau et d’aller rencontrer des gens! Les leaders de demain pourront faire connaissance avec des membres d’autres groupes et associations, et mieux comprendre comment se déroulent les investissements dans l’infrastructure. Cet événement est réalisé grâce au généreux appui de Fengate Capital Management et de PCL Construction. Des boissons et des hors-d’œuvre seront servis à cette soirée où sont conviés des membres du comité de YLI et d’autres professionnels de l’industrie. Le 1er octobre 2015, YLI Montréal a convié de jeunes professionnels à une réception de réseautage organisée par COSIME Inc. et Dentons Canada LLP. L’événement a été organisé aux bureaux de Dentons à Montréal et avait pour conférencier d’honneur Alexandre Riendeau. M. Riendeau exerce les fonctions de PDG du consortium privé Signature sur le St-Laurent; il est responsable de la conception, de la construction, du financement, des opérations et de l'entretien du nouveau pont qui remplacera le pont Champlain sur le St-Laurent. Les participants y étaient nombreux. M. Riendeau a discuté de son cheminement de carrière, de son poste actuel de PDG et de ses derniers projets. Cette séance de mentorat se déroulera avec David Caplan, vice-président du conseil de Global Public Affairs et ancien ministre du Renouvellement de l’infrastructure publique au gouvernement de l’Ontario. Organisé par Dickinson Wright s.r.l. et Global Public Affairs, l’événement comprendra un petit déjeuner suivi d’une discussion interactive. YLI Toronto a visité le nouvel hôpital Bridgepoint Health de 63 000 m2 (680 000 pi2) qui a ouvert ses portes en avril 2013. L’historique Prison de Toronto a été incorporée au nouveau site et réaménagée de manière à abriter le centre administratif et éducatif de l’hôpital. L’installation accueille expressément les patients atteints de maladies multiples et complexes. Le dîner « Lunch and Learn » de YLI Vancouver et de Partnerships BC a connu un grand succès. Amanda Farrell et son équipe ont donné pour YLI un exposé très informatif. Avec ses magnifiques vues sur le port, le Vancouver Convention Centre West était un lieu idéal pour cet événement très exclusif, auquel étaient invités des participants issus de la prospère industrie des PPP de la Colombie-Britannique. Cette séance de mentorat s’est déroulée en compagnie de Marni Dicker, vice-présidente directrice, avocate générale et secrétaire générale d’Infrastructure Ontario. Au cours du petit déjeuner organisé par Blake, Cassels & Graydon s.r.l., Mme Dicker a parlé de son cheminement professionnel et de ses expériences, donné des conseils et participé à une période de questions et réponses. Comme lors de nos séances de mentorat précédentes, les participants ont bénéficié d’une occasion unique de dialoguer avec l’une des leaders de notre industrie, dans un cadre chaleureux. Le séminaire a traité de l'évaluation et de l’étude des modèles financiers. Il a été animé par Jonathan Swan, formateur principal chez Operis dans le domaine des modèles financiers. Simon Lauzon et Agnes von dem Hagen, membres de YLI, se sont adressé aux étudiants choisis pour participer au programme d’étudiants de la conférence annuelle du CCPPP. La journée d’activités de YLI s’est terminée par la réception maintenant légendaire que YLI organise dès le premier soir de la conférence du CCPPP. L’événement inaugural de YLI Ottawa a été un franc succès. Lors de cet événement qui a attiré beaucoup de participants, les membres de YLI et d’autres participants de l’industrie ont établi des contacts au Backdrop Food and Drink où des hors-d’œuvre et boissons ont été servis. Les participants ont manifesté beaucoup d’intérêt envers la tenue d’événements similaires à l’avenir. Le dîner-conférence a été organisé par Casgrain & Compagnie Ltée à Montréal. Un survol du financement des projets et des infrastructures a été donné lors du dîner. La séance 101 des P3 offerte par McCarthy Tétrault a permis d’examiner en détail le processus de demande de propositions des partenariats public-privé et des documents liés aux accords relatifs aux projets du point de vue de l’avocat des responsables de projet. Les participants ont pris part à une visite sur place du nouveau tunnel piétonnier en cours de construction. Ce tunnel offrira aux passagers une voie d’accès fiable et facile vers l’aéroport Billy-Bishop de Toronto. Les membres de YLI à Toronto ont participé à une rencontre sociale du printemps et à une séance de ping-pong à SPiN! YLI Vancouver a organisé sa rencontre sociale du printemps au Rogue Kitchen & Wetbar. Les participants ont pu entendre Damian Joy, directeur exécutif par intérim d'Infrastructure Ontario, et le très honorable Herb Gray Parkway, ex-président et chef de la direction de Bilfinger Berger Project Investments Inc.
Les participants ont pu entendre Jim Dougan, président de Eastern Canadian Buildings pour PCL Constructors Canada Inc. M. Dougan a parlé de son cheminement de carrière, de ses expériences et des leçons apprises à ce jour, en donnant des conseils à ceux qui cherchent à assurer leur avancement professionnel au sein d’organisations semblables. Paul Franciosa, vice-président, Fengate Capital Management Ltd.
Jamieson Knowlton, vice-président, Brookfield Financial Corp.
Matt Rinfret, chef de projet, Construction, PCL Constructors Inc.
Les participants ont visité le projet primé du Village des athlètes des Jeux panaméricains du Canary District. Les participants ont visité plusieurs secteurs du site, y compris le nouveau YMCA, la résidence pour étudiants du George Brown College et les copropriétés du Canary District. Les participants ont pris part à une visite du centre de recherche du Centre hospitalier de l’Université de Montréal (CRCHUM). Événement organisé par l’équipe du CRCHUM, il s’agissait d’une occasion unique de visiter le premier projet PPP en soins de santé à avoir été substantiellement achevé au Québec. La nouvelle installation de 68 000 m2 du CRCHUM est un centre de recherche et de formation situé au centre-ville de Montréal qui se positionne comme étant un centre de haut niveau et d’avant-garde sur la scène internationale. Il s’agit du plus important centre d'expertise en recherche sur la santé au Québec.